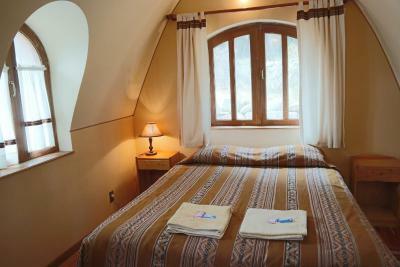 Lock in a great price for Ecolodge Copacabana – rated 8.2 by recent guests! 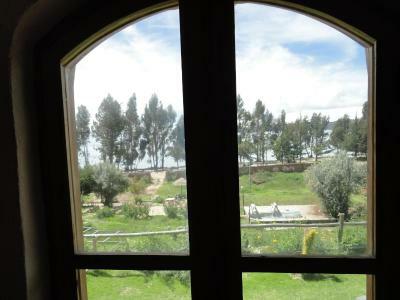 This ecolodge is located right on the shores of Lake Titicaca. The grounds are a spacious, rustic garden, and I spotted or heard at least a dozen bird species in 15 minutes. Our 2 bedroom cabin was also rustic, and had a kitchen. It’s a great spot if you just want to relax for a day or two on the shores of the lake. 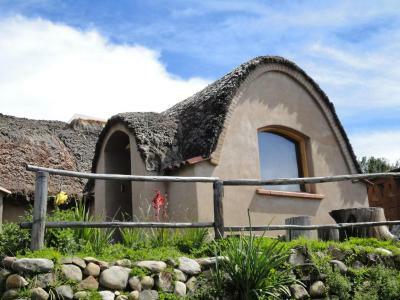 An Eco lodge that exceeds all expectations!! Beautiful, authentic and serene! The lodge was incredible, very thought out and well presented. It also had a lot of amenities, especially for entertainment, from a pool table to a lounge area with board games. The principal manager was super attentive and extremely helpful and was kind, really made a difference. 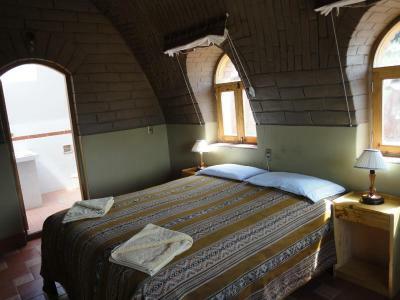 The rooms are enormous and beds are super comfy. The bathroom is very nice, big and new and very clean. Breakfast was good with a lot of choice including eggs made fresh. It's a beautiful place with lovely garden area overlooking the lake. Staff are very nice and very hard working. The owners son made an incredible breakfast, everyone was extremely friendly and they have a great dog (who may need a bath). I would stay there again in a heartbeat. The staff was really friendly and helpful. WiFi in rooms didn't work initially, but was promptly repaired. Quiet location, secure parking, great view. Would be perfect if staff was more attentive. Staff tried really hard and owner was great- contactable over WhatsApp. location very chilled and a great place to relax away from Copacabana, which doesn't have much to offer. 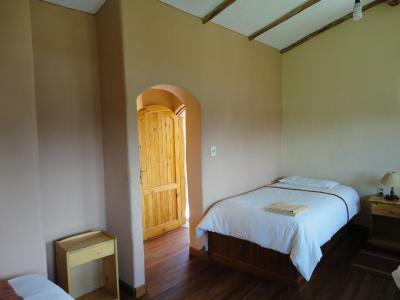 Ecolodge Copacabana This rating is a reflection of how the property compares to the industry standard when it comes to price, facilities and services available. It's based on a self-evaluation by the property. Use this rating to help choose your stay! 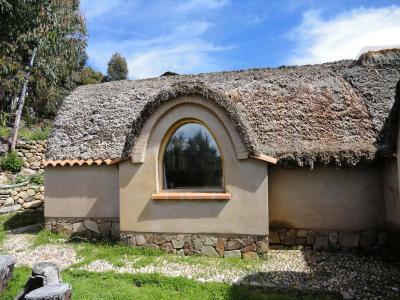 Surrounded by a 10.000 square yard private forest with direct access to Titicaca Lake, this picturesque eco-lodge offers both solar energy and electricity. Wi-Fi is free in common areas and a complimentary Continental breakfast is served daily. 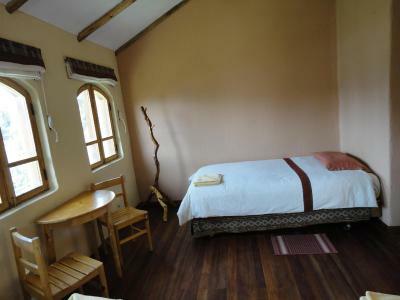 At Ecolodge Copacabana every room features views of the lake and garden. 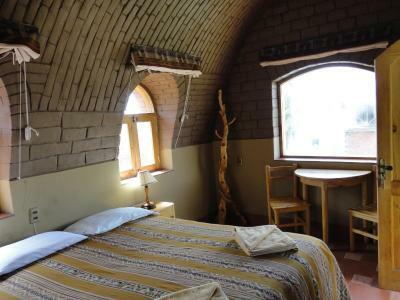 Rooms are completely decorated with stone furnishings, parquet floors and cream-colored walls. They have private bathrooms and heating. 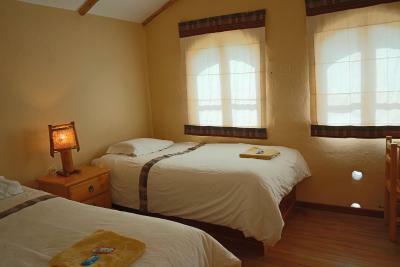 The family cottage also features a fully equipped kitchen, with dishwasher, coffee and tea maker, and a dining area. Guests can take walks through the property or boating trips in the lake with or without motor vehicles. The forest invites to hiking and bird-watching excursions. Guests can also taste a variety of local foods offered at the property's restaurant. 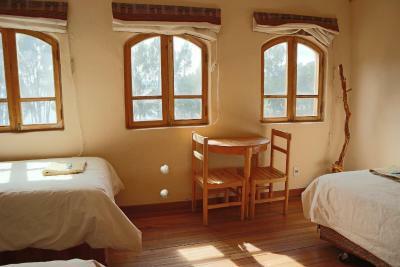 The inn is 0.9 mi from Copacabana City and a 4-hour drive from La Paz. Copacabana Airport is only a 15-minute drive and private parking is available without reservation. 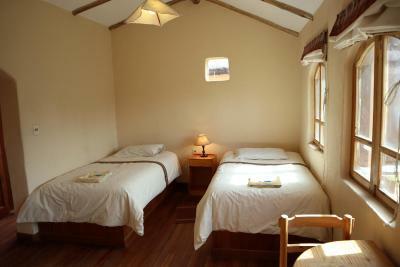 When would you like to stay at Ecolodge Copacabana? 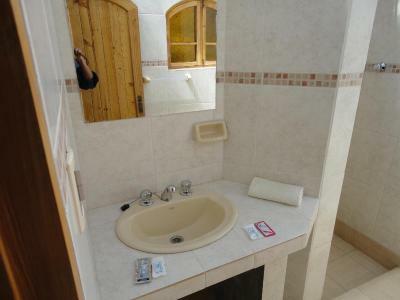 Features private bathroom and heating. 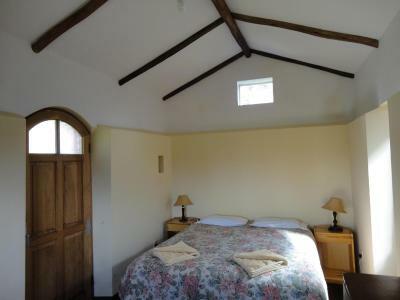 The cottage features 2 bedrooms, 2 bathrooms and a kitchen. 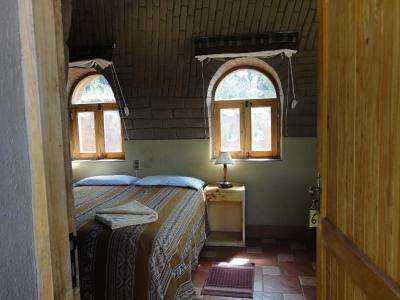 House Rules Ecolodge Copacabana takes special requests – add in the next step! One child under 12 years is charged USD 16 per night when using existing beds. 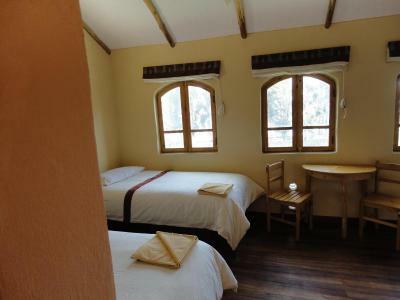 All children under 12 years are charged USD 16 per night for extra beds. 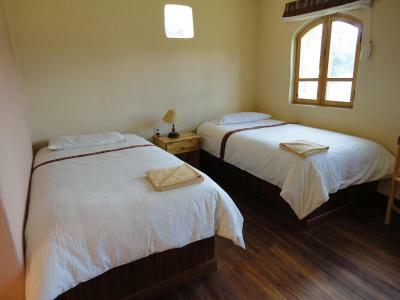 Any additional older children or adults are charged USD 21 per night for extra beds. 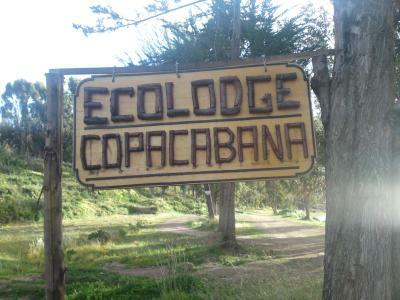 Please inform Ecolodge Copacabana of your expected arrival time in advance. You can use the Special Requests box when booking, or contact the property directly using the contact details in your confirmation. WiFi wasn't great, couldn't really download anything of do any work. And the actual staff was a bit strange, with communications problems, but it wasn't bad. Only real thing is, that you have to time your travel, as the walk from the property to the town is a good 25 minutes at a steady pace. If you need to be faster, then you need a taxi and it takes 10 minutes for a taxi to be called in, as there are no taxis passing that way. The walk to and from town can get a bit boring if you do it more than once a day but it's a nice walk along the lake. 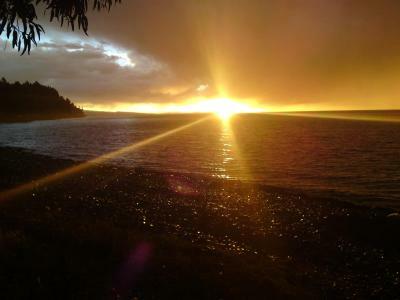 Location about 20 minutes away from the center but totally fine as you have a great walk along the Titicaca. The breakfast was very poor. Me and my husband are vegetarian. I asked the owner for a tomato and avocado for my sandwich but she said No. She say just told us to eat butter and jam with the bread. I asked for bread and she opened the bread plastic and the bread already had mold. She tried to give away her old bread. The room was so cold like winter. They didn’t provide any heater in the room. The hotel is in middle of nowhere. Not safe. The hotel doesn’t accept credit or debit card (Visa card) and she drove us to the town to take cash. Horrible experience in my life! Staff is poor, we stayed 3 days, on day 3 they asked if they could clean. During breakfast staff is constantly on their phones. On the last day one of the staff finally asked if we'd like eggs. They don't pay attention to the breakfast buffet so you have to ask for things a lot. Smiles are sparse. Internet was switched of at 22.00 and did not come on again the last morning. Wi-Fi didn't work during stay. Staff don't speak much English. What a wonderful lodge - right by the shoreline on the quiet end of the water. Watching sunset every late afternoon with no one around was blissful, something you don't get to experience often for sure!! My hut was very homely, well equipped and good sunlit bathroom. Had hot water every time I showered and electricity to charge my devices. WiFi only worked in the reception building when I was there however there are comfortable chairs there and free tea/coffee available there. The location was outside of the hustle of the centre of town. It was close to the lake, for afternoon bbq’s. Short walk to town. The staff were effortlessly kind. The rooms were clean and light filled. Little thatch roofed cottages. Quiet with plenty of outdoor areas to sit and enjoy the sunshine. Ants in our room. Breakfast could be a little bit better. The main drawback is the location. It is 25 mins walk on a dirt road or 15 B$ in a taxi. Also breakfast starts at 7.30 which makes it a bit rushed to catch all the 8.30am boats. Wifi was intermittent as you expect and very bad when there were more guests. On check out the price was higher but quickly corrected when I showed my booking.com reservation. And they only take cash. Exceptionally quiet. Felt safe. Large rooms. Water in shower was warm at night and warmish in the morning. The family is friendly but I can’t speak Spanish and so communication was limited. This property is 2 km from the center of Copacabana, so you won’t be making any quick trips to town. It was too far for our family, so we ended up staying at another (more expensive) hotel instead.